Air pollution has always been a problem in urban centers. But with the massive industrialization and urban expansion taking place in some of the most heavily populated regions of the world (China and India being foremost), the issue of how to deal with increasing emissions is especially important. And more and more, researchers and environmentalists are considering options that hits air pollution where it lives. Two such individuals are Danny Mui and Benjamin Sahagun, a pair of architects who have devised a rather novel concept for dealing with the thick layers of carbon dioxide pollution that are so common to major urban centers. 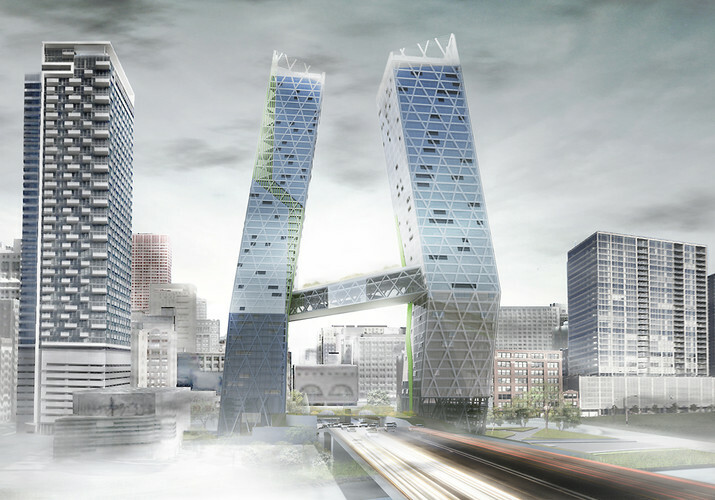 In essence, it is a pair of buildings that scrub CO2 emissions from the air, and thus marries the concept of Carbon Capture technology to urban planning. 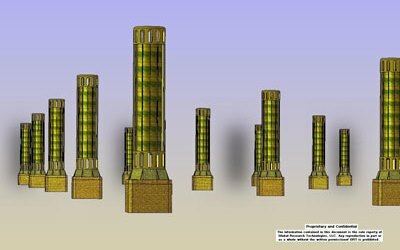 Dubbed the CO2ngress Gateway Towers, the concept involves two crooked buildings that are outfitted with a filtration system. This system then feeds the captured CO2 to algae grown in the building which then converts into biofuels for use in vehicles. In this respect, it is not unlike the artificial tree concept designed by Klaus Lackner, director of the Lenfest Center for Sustainable Energy at Columbia University. Much like these “trees”, the carbon capture technology involves using a entirely natural process to absorb CO2 from the air and then combine it with water, thus causing a chemical reaction that results in a fossil fuel precursor which can easily be converted. This fuel can then be consumed as gasoline or ethanol, thus giving people the ability to keep burning fossil fuels while they research cleaner, more sustainable sources of fuel. Ultimately, the idea here is not to offer a be-all, end-all solution to the problem, but rather to buy the human race time to clean up its act. And by ensuring that carbon capture technology is available in large urban dwellings, they are looking to ensure that one of the many symptoms of urban sprawl – i.e. large urban dwellings – are part of the solution. The scrubbers are the first step in a process that generates fuel for a fleet of eco-friendly cars for building residents. The system raises public awareness of air pollution and its impact on the health of Chicagoans. Aside from the scrubbers, the buildings boast some other impressive features to cut down on urban annoyances. These include the “double skin facade”- two layers of windows – that can cut down on outside traffic noise. 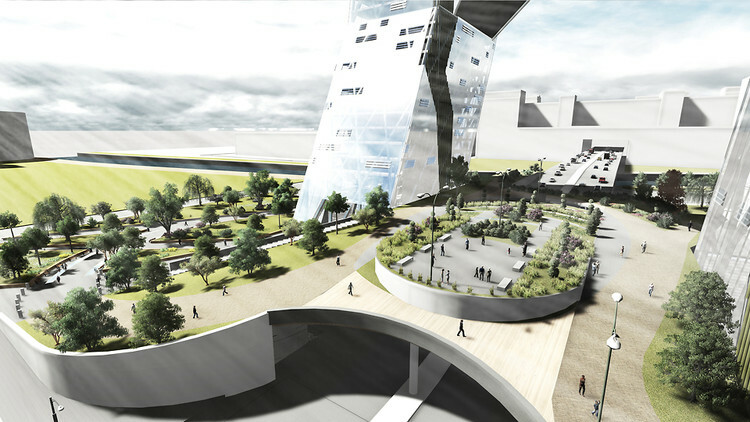 In addition, the spaces on either side of the buildings’ central elevator core can be used as outdoor terraces for residents. 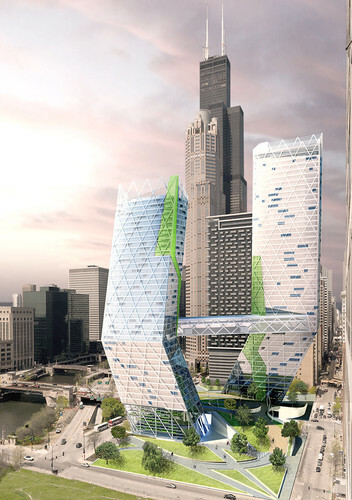 Apparently, Mui and Sahagun worked on the project while students at the Illinois Institute of Technology, where it earned them an honorable mention in the 2012 CTBUH student competition. According to Mui, they created the structure after the semester ended, but there are no immediate plans to build it. However, given the growing interest in arcologies and urban structures that reduce our impact on the environment, it is likely to garner serious interest very soon. Especially in China, where air pollution is so severe that it causes up to 750,000 deaths from respiratory illness a year and cities are still growing, buildings like this one could easily become the stone that kills two birds. Towards a Cleaner Future: Fuel Cell Breakthrough! Is there any reason the buildings are crooked? Or is that part just aesthetic? I believe it is, futuristic minded architects looooove to play with form. Anything not straight or linear is like crack to these guys! Sounds like a good idea. Maybe I can work it into RC somehow.